There are 2 modes of transportation available when travelling from Prague airport, officially called Václav Havel Airport Prague (PRG), to the city centre of Prague: Taxi and Bus. Taking a Prague airport taxi is the most convenient and quick option. The ride to the city of Prague costs approximately 27€ (694 CZK) and it takes around 35 minutes. The cheaper alternative is the bus. However, there is no direct bus route from the airport to the downtown area of Prague. Bus tickets cost only 1.20€ (32 CZK) per person and the journey takes a little less than an hour. Welcome Pickups offers meet and greet services and a friendly introduction to Prague at the same price as a regular taxi. Click here to see the cost. The most convenient and comfortable way to reach Prague downtown area is by taxi. Prague airport taxis are usually white-colored. Moreover, you can easily recognize them by their taxi logos and roof signs. The taxis at the airport work on a first-come-first-served basis; therefore, you might have to wait in line in order to get one during the peak time. Under normal traffic conditions, the taxi trip to the city centre of Prague takes approximately 35 minutes. Prague airport taxis do not offer an official fixed price for the trip from the airport to central Prague. Your ride will be charged by a taximeter, based on distance. However, the estimated cost of the journey amounts to 27€ (694 CZK). Additional charges from driving on public holiday or late-night driving may apply. It is advisable to book your Prague airport transfer in advance in order to get better services and rates. Taxis are much more convenient than other transit options since they can take you straight to your hotel. In addition, they run 24/7 and the fare is cheap if you split it among friends. Be aware that the taxis of Prague have a bad reputation because they used to provide inadequate services and overcharge the tourists. Therefore, it would be better to book a private transfer in advance or negotiate a reasonable fixed price with your taxi driver since some scammers may even trick the meter. Most taxis accept payments by credit/debit cards. All taxi drivers are required to know at least basic english. Unfortunately, taking the public bus from Prague airport will not take you straight to the city centre. 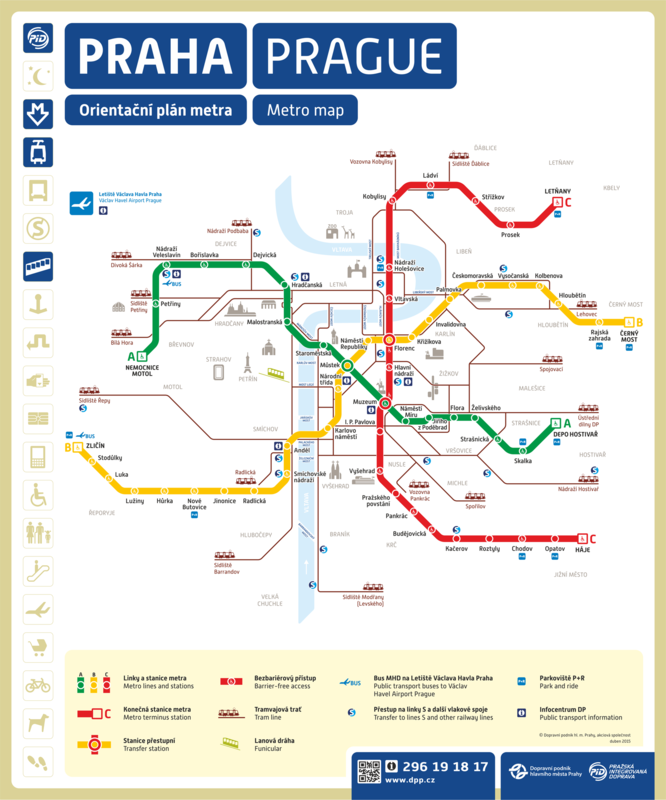 However, the buses from the airport will take you to one of the metro lines of Prague. The most frequent is bus No. 119. It travels from the airport towards Nadrazi Veleslavin (Green Metro Line A) every 15 minutes and the travel time is approximately 20 minutes. In order to get to the city centre of Prague you will have to take the metro and stop either at Můstek or Muzeum station. At rush hour, metro trains run at 3-5 minute intervals and the journey towards the centre lasts approximately 25 minutes. Bus No.100, which goes towards Zličín (Yellow Metro Line B), is a good option if you are travelling to the western part of the city. How much is the bus from Prague airport to city centre? Single bus tickets cost only 1.20€ (32 CZK). You can purchase your bus tickets either from the Prague Public Transport counters in the arrivals halls of terminals 1 and 2 or from the ticket machines at each airport bus stop. *Tickets can also be purchased straight from the bus driver, but they cost 1.55€ (40 CZK). Buses No. 119 and 100 run roughly from 04:15 a.m to 23:30 p.m. The Metro trains run from 05:00 a.m to 00:00 a.m. Buses No.119 and 100 depart from the exits D, E, F of Terminal 1 and C, D, E of Terminal 2. Even if the bus ride is cheap, the fact that there is no direct line from the airport to the city centre of Prague makes the journey very inconvenient and time consuming. It is good to know that the bus No. 510, which operates at night-time only (00:00-05:00 a.m), makes a stop at I. P. Pavlova, near Wenceslas Square. A bus ticket is valid for 90 minutes for all public means of transport. You need to purchase an additional half-price ticket if you are carrying a large suitcase. How much is a taxi from Prague airport to city centre? The average price of a taxi ride from Prague airport to the city centre of Prague is 694 CZK (27€). Without traffic, the journey will take approximately 35 minutes. How much is a bus ticket from Prague airport to city centre? Unfortunately, there is no direct bus line from Prague airport to the downtown area of Prague. First, you will to take a bus towards a metro station and then use the underground trains for your transfer to the city centre. Regular bus tickets cost 32 CZK (1.20€) and they are valid for the tube as well. How far is it from Prague airport to the city centre? The distance between Prague airport and the city centre of Prague is approximately 18 km.